'Pot Luck' is a six-part original comedy webseries filmed in Wellington, New Zealand. The series follows Debs, Mel and Beth as the three friends negotiate friendship, family and finding love at their weekly pot luck dinners. Ness is a filmmaker based in Wellington, New Zealand with a range of projects under her belt. After deciding she wanted to make a webseries for her next project she found herself thinking of the many pot luck dinners she's been to over the years, and the scores of characters and stories she could mine from such an occasion. With a focus on telling stories that include LGBTQI characters Ness is loving the process of bringing this comedy webseries to life. Ness has a BAppA in Scriptwriting from Whitireia, and is currently the Head Tutor at the New Zealand Film School. Robin has over thirty years experience in the New Zealand Film & Television industry with both domestic and international productions. Through her company Robin Murphy Productions she has produced a range of short films, a documentary webseries, and has a slate of short and feature films in development. Robin first worked with Ness as the producer for 'Active in Hell' and has been involved with 'Pot Luck' from the early stages. Pikihuia is an emerging DoP with a keen eye for framing and a mind for the story. A graduate of the New Zealand Film School, Pikihuia has worked on a range of projects in the Wellington industry and is excited to be stepping up to the DoP role for 'Pot Luck'. Pikihuia has worked with Ness on a number of projects in the past few years and together they continue to build a strong creative relationship. Nikki has a bunch of experience in front of the camera - you may have seen her in shows such as Super City and Housebound or maybe you remember her breakout role as 'Marty' in The Whole of the Moon? Nikki also works on the other side of the camera and is an award winning writer and director with short films 'Snow in Paradise' and 'Ma' hitting festivals throughout the world. "I'm really excited to be playing Mel. 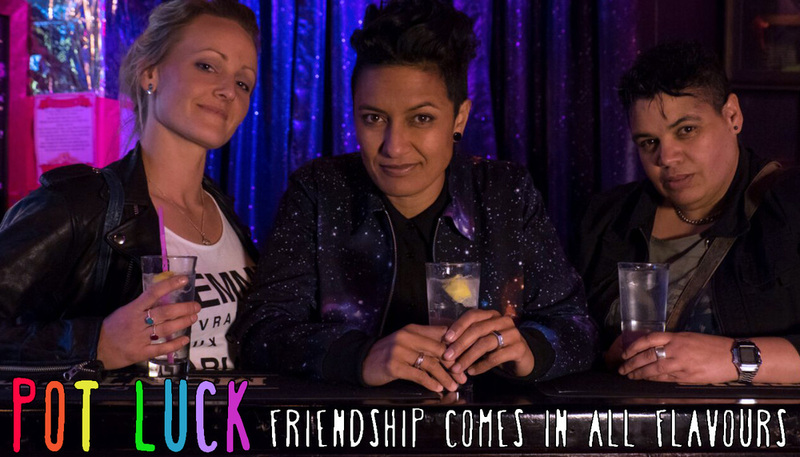 I think that people are craving a web series that's refreshing and different, and with popular shows like The L Word, and Orange is the New Black, I feel that Pot Luck will be well received by audiences around the globe who'll get an inside perspective of lesbian life in Aotearoa, New Zealand. Now, off to work on my inner, 'Toned, tanned confidence bordering on arrogance' character. Shouldn't be too hard...right?" Anji is a super talent with a range of screen credits in the UK, you might have heard her voice on Wallace & Gromit: The Curse of the Were-Rabbit, in Postman Pat or , or perhaps you caught her as the midwife delivering Dev and Sunita's twins in Coronation Street! Anji is a singer and performer with great presence, she's also a voice actor and vocal coach and we're excited about the magic she'll bring to the character of 'Debs'. "This is gonna be fun! I'm keen as to start filming Potluck and really getting to know Debs. I want to show the 'soft' side of this butch Lesbian - we don't often see that side of butch Lesbians portrayed on screen, and definitely not in Aotearoa! The relationships between the three main characters (Debs, Beth & Mel) are so interesting and 'real' - I'm looking forward to hanging out with my new on screen B.F.Fs!" Tess is also busy behind the camera with the Cake Punchers Collective including short film 'Coffee Group' which she has written, directed AND has a leading role in. Basically, she's awesome. "I'm looking forward to finding Beth through the close friendships of these three women. The way we approach our challenges are often influenced by those we surround ourselves with, especially those who know you well, who hold a mirror up to you so you can never run away from your s$%t! I'm excited to be part of fresh original work and to play someone not often represented on kiwi screens."